All across Belfast, police stations squat on the landscape like fortresses. The barbed wire, reinforced concrete and observation towers are testament to the hard, often vicious fight against paramilitary crime and terrorism. But those at the sharp end of Northern Ireland's fight against modern organised crime inhabit far less well-armoured premises. The staff of the Assets Recovery Agency (ARA) spend their days in non-descript - even down-at-heel - offices near central Belfast. Their work reflects the fact that despite radical changes in the political landscape, many of the hard men behind the violence are still there. Now, though, the smuggling and extortion, bank raids and protection rackets are for personal gain rather than for political advantage. "There are people in groups across society who are not engaged in further paramilitary activity - but will engage in organised crime because it funds their lifestyle," says Northern Ireland security minister Paul Goggins. ARA's heavy presence in Northern Ireland reflects the view that as organised crime in Northern Ireland has evolved, so have the means for tackling it. If profit is now the motive, then taking the profits away is one solution. That way, so the argument goes, you can weaken the hold that former paramilitaries have on the communities in which they are deeply embedded. But what about the preconception, widely held in the rest of the UK, that people on both sides of Northern Ireland's sectarian divide still back the paramilitaries? Far from it, leaders from both communities say. "People know who the crooks are," says Brendan Duddy, a nationalist member of Northern Ireland's policing board, and once one of those who helped make communication between the government and Provisional IRA possible. "No-one is opposed to saying to someone: you've got £300,000 worth of cars and you haven't worked in 10 years, so don't come complaining to me if you're being done." Similarly, on the Unionist side, Democratic Unionist Party MP Sammy Wilson is in no doubt. "There's immense support for this kind of thing," he says. "In my own constituency, there are women associated with the UDA (one of the Loyalist paramilitary groups) who protested when police came to seize documents and computers on a raid. "But 95% of people don't want these criminals getting away with it." ARA's job is to go after criminals through the civil courts. This has led to accusations - admittedly often from its targets - that it is breaching people's human rights. It also means that its work has taken a very, very long time. "Perhaps, in the first 12 months, we were naive," says Alan McQuillan, ARA assistant director and its chief in Northern Ireland. "We had no way of knowing how long the civil recovery process was going to take." The result was that the agency fell short of government targets. In 2005-6 in England, Wales and Northern Ireland, ARA managed to convert £4.1m in assets into hard, recovered cash against a target of £6-12m. Other criticism has come from the fact that initially, it targeted many more Protestants than Catholics - sparking suspicions of a political agenda. Mr McQuillan resists this suggestion. "When we first started up, perhaps the Nationalist community had fears that we wouldn't act fairly," he says. "That's changed." In the future, Mr McQuillan says, the emphasis will be on persuading criminals to reach settlements. One example of the new methods in practice was Northern Ireland businessman Dylan Creavan, who recently agreed to pay ARA £18.5m - despite being acquitted of VAT fraud. "I think lots of our clients are being advised to fight," Mr McQuillan says. "And good luck to them, that's their right. But we think they'll lose." ARA, however, is only one part of Northern Ireland's asset recovery strategy. Government policy demands that police and other law enforcement bodies should always go for a criminal conviction first - and only hand a case to the agency if they decide not to prosecute or when a prosecution fails. So the Police Service of Northern Ireland has first crack at any given target, and is adding new staff to deal with this responsibility. The biggest change will be to put financial investigators (FIs) - specialists in asset recovery - in each of its 29 districts. And the criminals are paying for it, thanks to a policy which gives half the money seized back to the organisation responsible for the confiscation. The beauty of the plan, one senior PSNI officer says, is it creates an opportunity to embed asset recovery in how the police operates. "Police forces are driven by targets," he says. "That's what commanders are measured by. "We'll try to get every penny staying in the district - then you'll get commanders coming to the FIs every day and asking: 'What have you got for me?'" This kind of bottom-up activity could be crucial. January 2007: Abolition? The Home Office announces that ARA will cease to exist as a separate agency in 2008, becoming part of the 4,000-officer Serious Organised Crime Agency. November 2006: Dylan Creavan, £18.5m. Creavan was acquitted of VAT "carousel" fraud in 2005, but after being shown evidence that his property was funded by crime, agreed to hand over assets including a villa in Marbella and four racehorses. 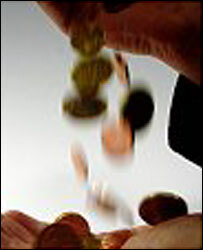 June 2006: ARA announces it has restrained £85m in 2005-6 - three times its target, of which £15.9m was in Northern Ireland. But only £4.1m (£800,000 in Northern Ireland) had actually been realised. November 2005: Jim Gray: £200,000. 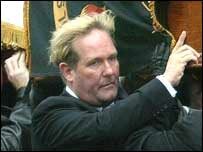 ARA froze property worth £200,000 which had belonged to the late Jim Gray, formerly "brigadier" of the East Belfast UDA. October 2005: Dermot Craven and Brian Pepper. ARA, together with police, raids premises of Manchester property empire. According to the two men, the agency believed they were involved with Thomas "Slab" Murphy, widely regarded as a senior IRA member. They denied any such involvement. A common criticism of ARA has been that by going after the top dogs - and with so many cases taking so long - the effects have not always been felt by the people at ground level. "What people want to see is £10,000 or £20,000 being frozen from some criminal in their area," says Brendan Duddy. "There's the satisfaction, and the link with the man in the street who thinks: at last, they've got him." Police officers are inclined to agree. High-level organised crime is certainly being tackled through asset recover, one high-ranking officer says. But in the meantime, so-called "Level 1" crime - which affects communities and districts directly every day - is slipping through the net. But it is the small-time crooks on whom the big fish depend, he argues - and so tackling the ground level can help put organised crime on the back foot. "The impact there is far greater than the sum of its parts," he says. ARA is now promising to devote a third of its resources to Level 1 crime - but the agency's days are numbered. By 2008, it will have been abolished and rolled into the Serious Organised Crime Agency, and Soca - as its name suggests - focuses on high-level crime. Then again, the civil powers once wielded by ARA alone will be much more widely spread, usable by any Soca officer and by prosecutors. Meanwhile, Soca is promising to keep the pressure up in Northern Ireland, as well as guaranteeing jobs to all ARA staff. And with the government doubling its target for asset recovery nationwide to £250m a year by 2009-10, there is clearly still work to be done. Is assets law fair or draconian?